A U.S. based investment manager with strong ties and community involvement. We specialize in individual stock selection for separately managed accounts. Each client’s portfolio is individually designed in accordance with their investment objectives and risk tolerance. We service a broad range of clients, such as individuals, pension funds, profit sharing plans, corporations, and foundations. Rutherford Investment Management is a multi-capitalization growth stock manager, but the firm does offer balanced accounts for those clients seeking diversification in domestic and international fixed income securities and international equities. Portfolios are continually monitored for compliance with client goals and investment objectives. 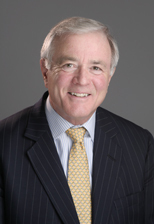 Bill Rutherford is a graduate of Harvard Law School and the University of Oregon. Bill served as Treasurer of the State of Oregon, chair of the Oregon Investment Council (with responsibility for investing $14 Billion at a time when Oregon was generally regarded as the best public investment fund in the nation), a four-term member of the Oregon House of Representatives, and Co-Chair of the Council of Institutional Investors. He has served as President, CEO and Board member of two investment companies with offices in New York City, London, Paris, Tokyo and Frankfurt. He has been a board member of a number of international and domestic companies. Bill was instrumental in the restructuring of Metallgesellschaft, an international trading, oil, and gas company, and Europe’s 10th largest company. William Rutherford is available to speak to your company, group or association. Learn about William Rutherford’s engaging book Who Shot Goldilocks?